In the 1960’s, Robert Paine began prying starfish off of rocks and tossing them into the ocean as far as he could. In doing so, he was testing the importance of predators in ecosystems. Paine’s research helped support an idea that his former instructor (and colleagues) had come up with. It is called the green world hypothesis and is still applicable to ecology today. This hypothesis states that ecosystems are regulated from the top-down. Predators regulate herbivores, which leads to vegetation growth. It’s a different approach to the standard bottom-up food chains that show that plants get energy from the sun, and then feed the herbivores, which, in turn, feed the carnivores. Paine’s conclusions did not disprove bottom-up regulation. They just added another dimension, that of predator regulation. Two new terms came from these early experiments: trophic cascades and keystone species. Here’s a video highlighting Paine and his landmark research. Fast-forward to 1995 when wolves were brought back into Yellowstone National Park. Many conservationists and biologists thought wolves were going to “fix” things. The hope was that the wolves would regulate the elk populations. The elk had increased in number because, without wolves, they had no natural predators. This increase was a problem because the elk were not allowing cottonwood and aspen trees to mature. These two types of deciduous trees are important to many species including songbirds, insects, and beavers. So, Paine’s theory predicted that having wolves in the area would limit elk growth, and therefore, increase aspen/cottonwood stands and eventually help songbird/insect/beaver populations. Currently, there is one problem. The scientific literature does not seem to support that this is actually happening everywhere in Yellowstone (not yet any way). One explanation could be that there has not been an adequate amount of time to accurately test this trophic cascade theory. We typically want quick results, and in this case, it just may not be possible. What if, though, instead of looking to the elk population problem to support having wolves in an ecosystem, we focused on more immediate benefits. For example, more wolves mean more carcasses, and more carcasses are good. 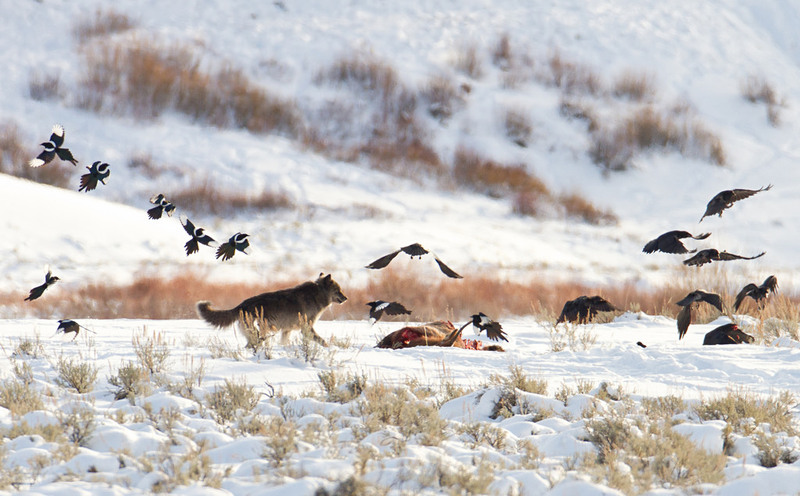 Before the wolf reintroduction, the majority of carrion/carcass buildup would be at the end of winter. Elk, deer, and bison struggle during the harsh winter months, and some end up dying from starvation. This concentration of carrion is not good for maintaining a strong scavenger population because most of the meat ends up rotting. The scavengers cannot eat fast enough. It is much more advantageous if the carcasses are spread out throughout the year. That’s exactly what having efficient predators, like wolves, do for an ecosystem. Elk carcasses can be found in all seasons now that wolves are back. This helps both large and small predators. Human hunting also leaves too much accumulation of meat. For comparison, from November to May, wolves provide an average of 29,000 pounds of meat for scavengers scattered throughout. From January to mid-February, hunters provide about 73,000 pounds of meat. That’s too concentrated to help the scavengers in any way. There are also conservation implications here. The excess accumulation of meat is usually eaten by ravens, eagles, and other birds of prey. When birds of prey are attracted to an area where they normally would not hunt (spillover), there could be problems. For example, ravens tend to feed on the eggs of the endangered sage grouse. If ravens are attracted to areas where the grouse have eggs, this could greatly impact the grouse population. So, wolves directly help scavengers of all sizes by killing prey all year long, and thus scattering the carcasses. These wolf-kill carcasses also benefit many overlooked species, the invertebrates. To completely understand how large predator-prey interactions (like wolves and elk) affect ecosystem functioning, the invertebrate carrion ecosystem cannot be excluded. One fascinating study done in Yellowstone specifically looked at how elk and bison carcasses impacted Coleopteran (beetle) communities. Data sets from both 1978 and 1993 showed that 445 different species of beetle took advantage of kill sites. This included 23,365 individuals! Beetles showed up in higher numbers at the carcass sites when compared to control sites (without carcasses). The most common carcass-associated beetle was a silphid species, Thanatophilus lapponicus. At elk carcasses, 2730 individual silphids were collected, with 0 being collected from control plots. As far as bison carcass plots, 4958 individuals were found compared to 4 being found at control plots. They were congregating where the food was. Keep in mind, this study was just dealing with beetle diversity. 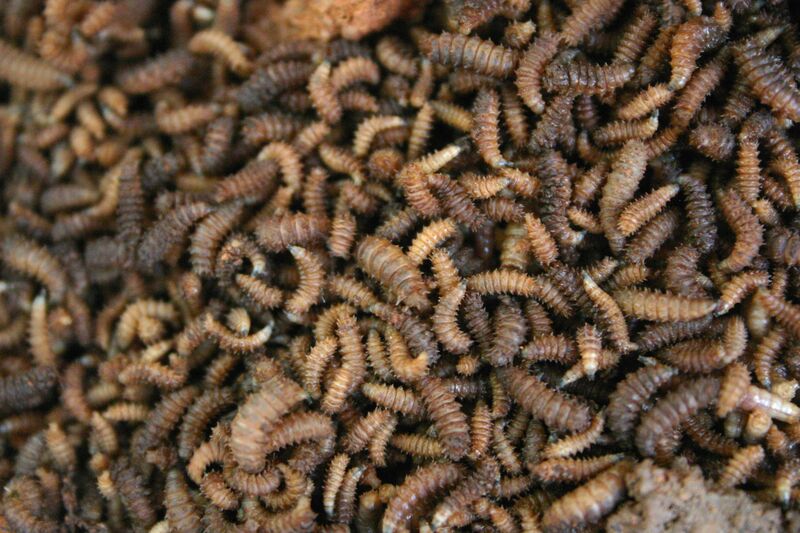 Think about all the other insects, bacteria, and fungi food at carcass sites. As far as my knowledge, there has not been a study to document all the species that benefit from a large vertebrate carcass in Yellowstone. This is probably not practical. So, wolves are definitely impacting the ecosystem and helping out species. Maybe we are looking in the wrong spots. Maybe we should narrow our focus and look to the invertebrates or even the microbes.